2. On the Add New box, type the name of the following App Configs and set their values to true. AllowEntityPageFiltering Displays a category dropdown on department pages so that the customers can filter the department products by category, and vice versa. AllowEntityManufacturerFiltering Displays a manufacturer dropdown box on category and department pages, so customers can filter that category and department pages, so customers can filter that category’s product by manufacturer. AllowEntityProductTypeFiltering Allows all entities to be filtered by available product type. 4. 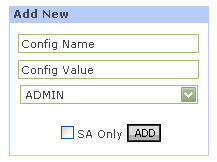 The filters are displayed in a form of a dropdown box on each entity page. NOTE: This is an advanced, unsupported feature - our tech support staff cannot assist with any issues created by enabling this feature! If you have questions, please direct them to http://forums.aspdotnetstorefront.com.